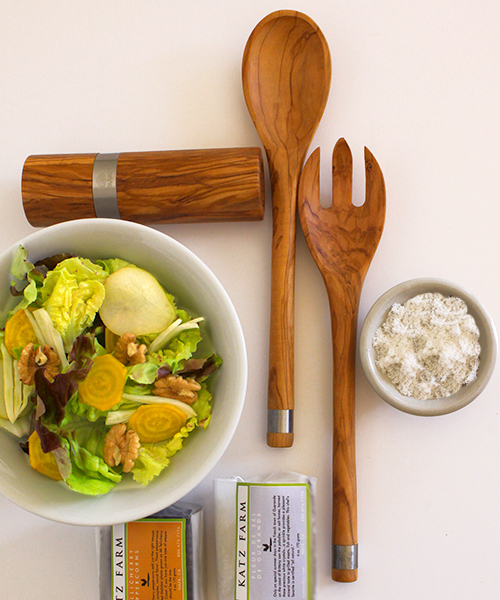 We love sourcing olive wood pieces, especially when they are as elegant, well-made and functional as these handsome salad tongs. Made in Provence by the venerable family company of Berard, each piece is turned and milled to highlight the grain of olive wood while creating artful and heavy-duty treasures. These are quite substantial and will make a grand presentation when serving salads. Each set is unique and sturdy 12" x 2.5"
This set makes a stunning gift given with a bottle of KATZ Organic Olive Oil and KATZ Orleans Method vinegar. Or give the ultimate gift of the Well-Appointed Salad Box.